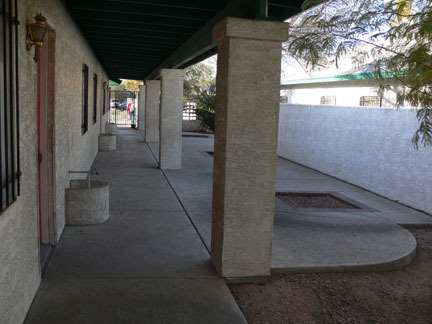 SBAAZ provides limited affordable housing for single adults 18 and over who have spina bifida. These wheelchair accessible shared housing units are near shopping and public transportation. Tenants must be able to live independently and manage all necessary self-care. Units contain a kitchenette and access to laundry facility. We are a SMOKE FREE, PET FREE campus. See details for tenancy and send us your pre-application to be notified when a unit becomes available. Rents cover basic expenses of this program, if you would like to subsidize to help with needed maintenance and upgrades, please make a donation. Your gift of $200 or more will provide some of our wish list items like flowers, blooming shrubbery, outside decor and park benches!